Growing up, my family was very close friends with another family, so close that we were all basically… family. We’ve known them since I was 1 year old. My older brother became friends with one of the kids in the family in kindergarten, and more than three decades later, we’re all still close. My good friend Debbie is 8 years older than me, which is a lot when you’re growing up, but she’s always been more like a big sister. Our families spent summers together for years at a camp in Rome, New York. Their family owned a beautiful cottage at camp, and my family rented a different one every year. Those summers were amazing. I don’t get back to camp often enough, but it’s one of my absolute favorite places in the entire world, and I still dream about owning my own cottage their someday. I’m really going to have to get on that though. Like, now. We spent countless evenings roasting s’mores and hot dogs over a bonfire, swimming and canoeing at the lake, hiking, playing kickball and baseball, reading tons of books, and generally milling about in the outdoors. We never really “roughed it'” staying in the cottages, but it was still certainly a much simpler rendition of a house or home. Everything was reduced to miniature-size and was more compact. Hot water heaters were small so a complete shower needed to be accomplished in approximately 2 minutes. Stoves, ovens, and refrigerators were all mini-versions. If there was a television at whichever cottage we were staying in, it was usually ancient and tiny. A telephone line was uncommon and a total luxury. Yeah, it wasn’t primitive living, to be sure, but we did have to make adjustments. Those were incredibly fun times though and I miss those days sooo much. Everything was so simple and easy… you could really enjoy the little things. Some of my best memories from my childhood were summers at camp! I must make it a priority to go back next year. Anyway, this is all leading up to something, I swear. Sooooo, because we stayed in simple and unmodern accommodations, some adapting took place. And a lot of that occurred in the kitchen. If I’m being honest, my mother wasn’t a great cook even with full access to the best in appliances and resources. She’s good at many things, but cooking wasn’t one of her key talents, per se. Anyway, the matriarch of the other family was an excellent cook and baker though. Esther had a knack for it. I remember sharing meals at their cottage many, many times and I was in awe of the dishes she’d whip up. She was generally a creative and crafty person anyway, and it definitely translated to her recipe and food-prep personality. 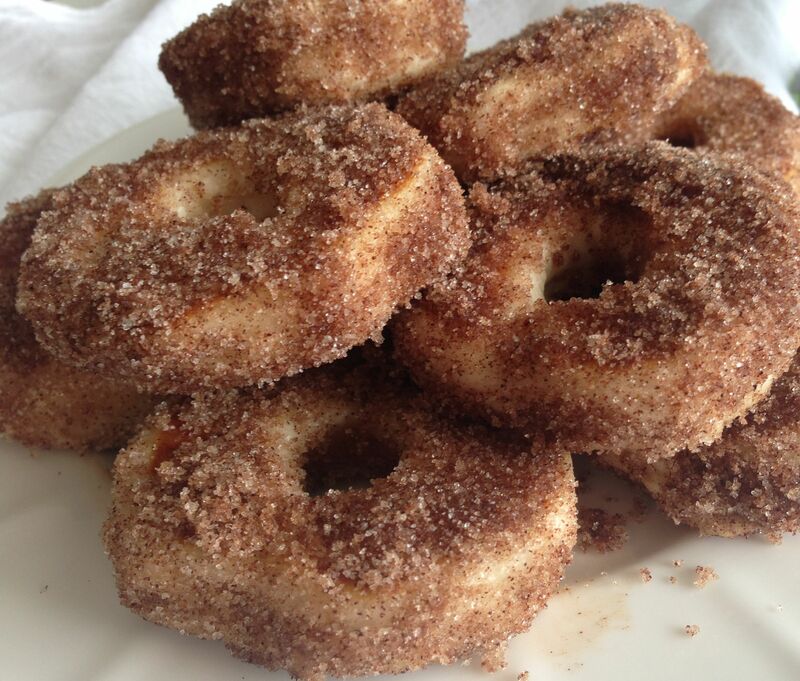 One time when we were over for brunch, I watched her get a can of plain old Pillsbury Biscuits out of the fridge, not even the Grands version, and she transformed them into cinnamon-sugar donuts within minutes. I am not exaggerating when I tell you I was amazed. It was like magic or witchcraft. 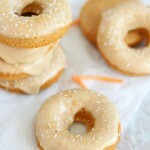 To my little kid, donut-obsessed mind, it was literally GENIUS. That’s probably ridiculous, right? But seriously, I was truly astonished that you could turn regular, simple Pillsbury Biscuits into DONUTS, the greatest food ever. 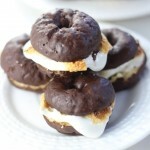 For a while after I was introduced to these little gems, I made them on a regular basis. I completely forgot about them over the years though. Quite honestly, I completely forgot about the regular little Pillsbury Biscuits too, but I happen to spot them the other day in the grocery store and I remember these donuts out of nowhere. I knew I HAD to make them. Had.to. When I saw the package of 4 cans all bundled together, it totally took me back to like 1990. It was a nice jog down memory lane. 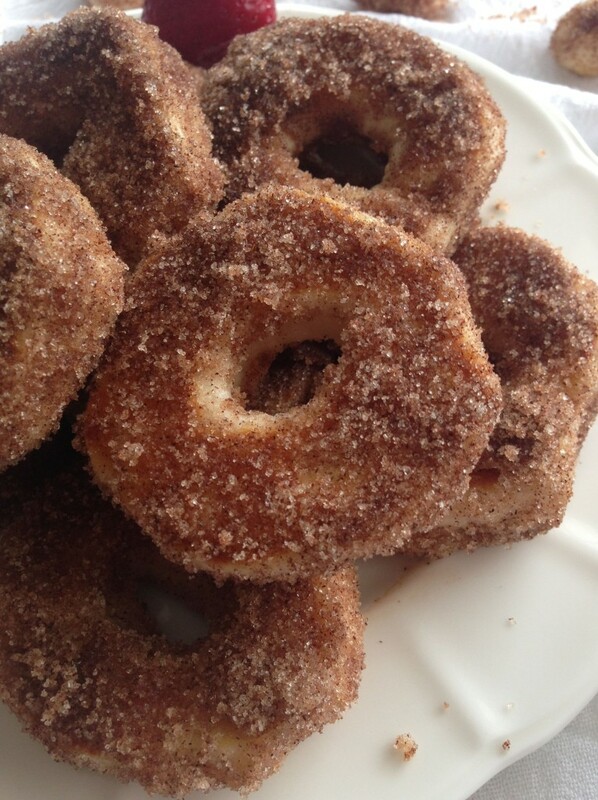 And so were these donuts. The verdict? They were everything I remembered them to be! 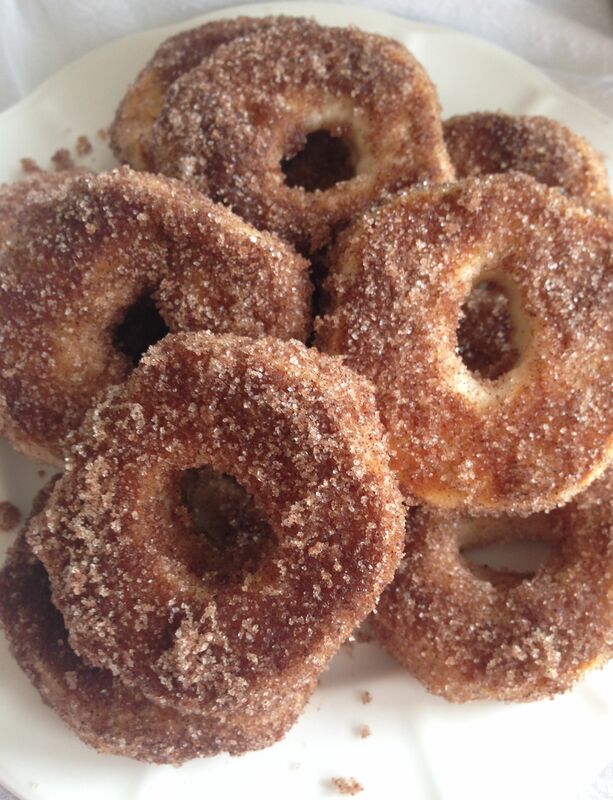 They were every bit as easy and delicious as the cinnamon-sugar donuts I remember Esther making all those years ago. This time, they are here to stay. Also? 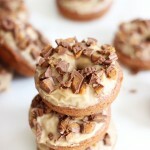 I definitely need to play around with these and venture into other toppings. 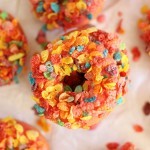 Think of the possibilities… glazes, icing, sprinkles… OOOOOH sprinkles. Yeah, that’s happening. 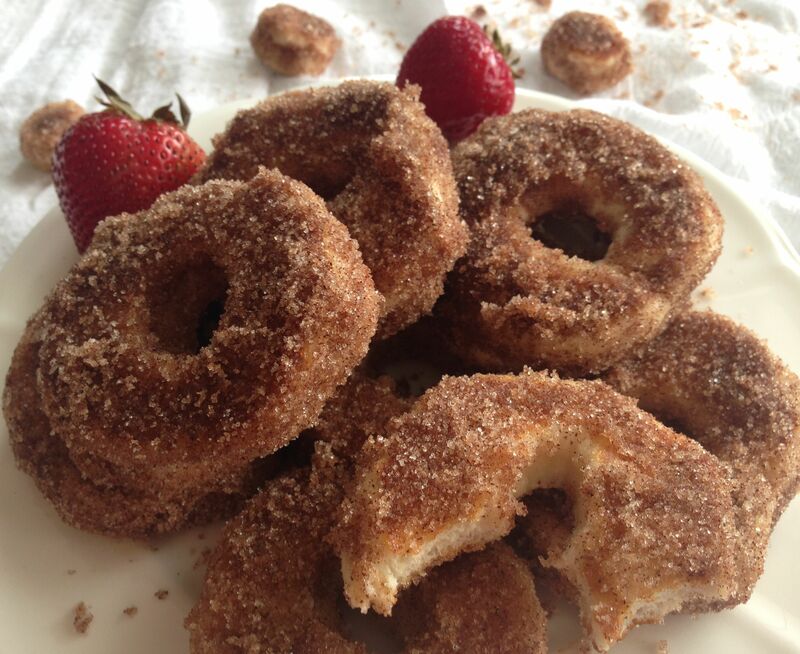 The biscuits totally puff up and get fluffy and airy, and when you dunk them in cinnamon-sugar, they legitimately end up tasting like donuts! It’s kind of incredible. These are a great kid-friendly food, but adults will like them too. Initially, grown-ups will get a kick out of the novelty of how these are made, but then they will actually be impressed with how they taste too. They make such a great addition to a brunch table. 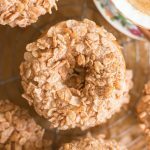 So fun, easy, and delicious. 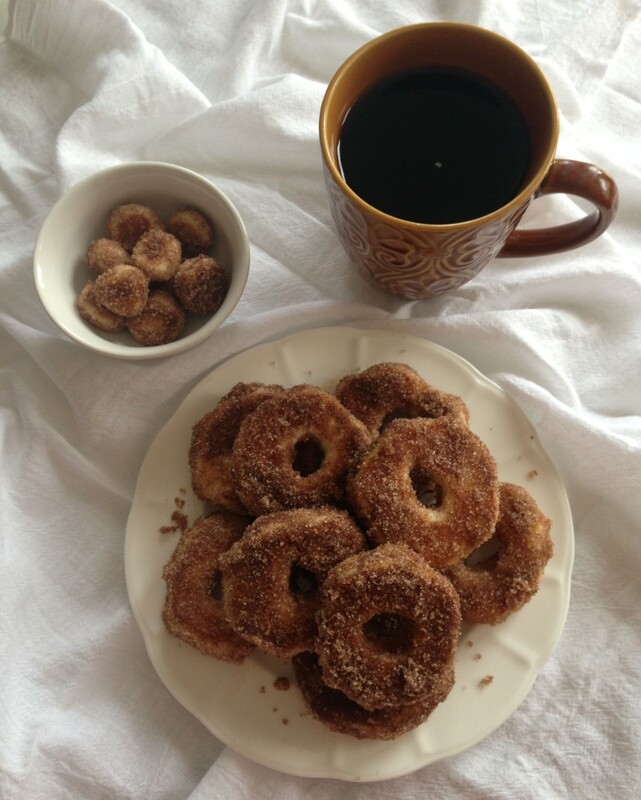 In a small bowl, combine cinnamon and sugar; set aside. Separate Pillsbury dough into 10 biscuits. Flatten each biscuit into 2.5 inch rounds, approximately. 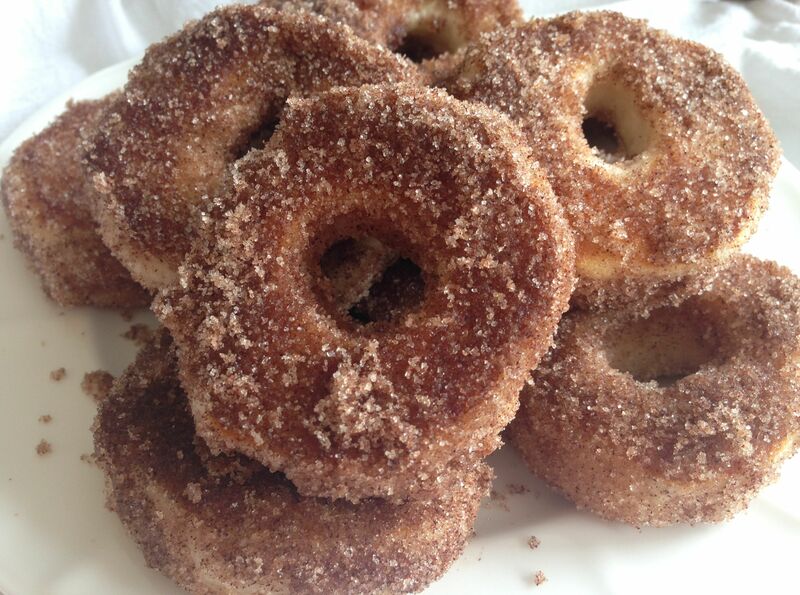 Using a finger or a 1-inch circle cookie cutter, cut a hole in the center of each round. Melt 1 tbsp. butter in a large frying pan over medium heat. 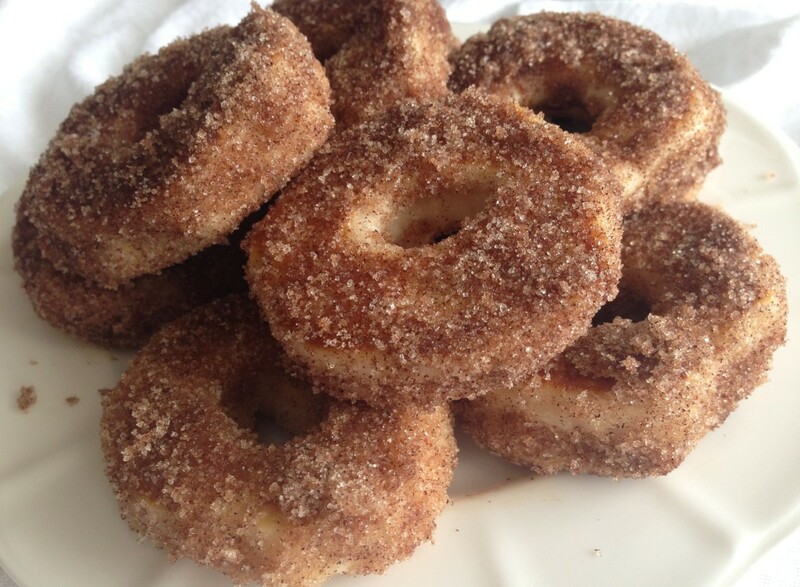 Place donuts in frying pan and cook for about 2 minutes each side, or until lightly browned. 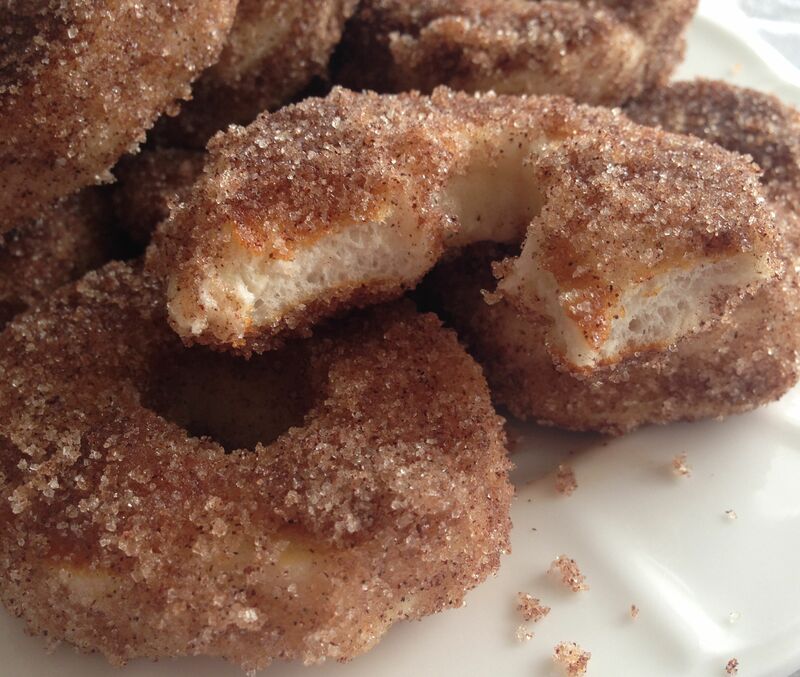 Immediately remove donuts from heat. In a small bowl, melt the remaining butter. 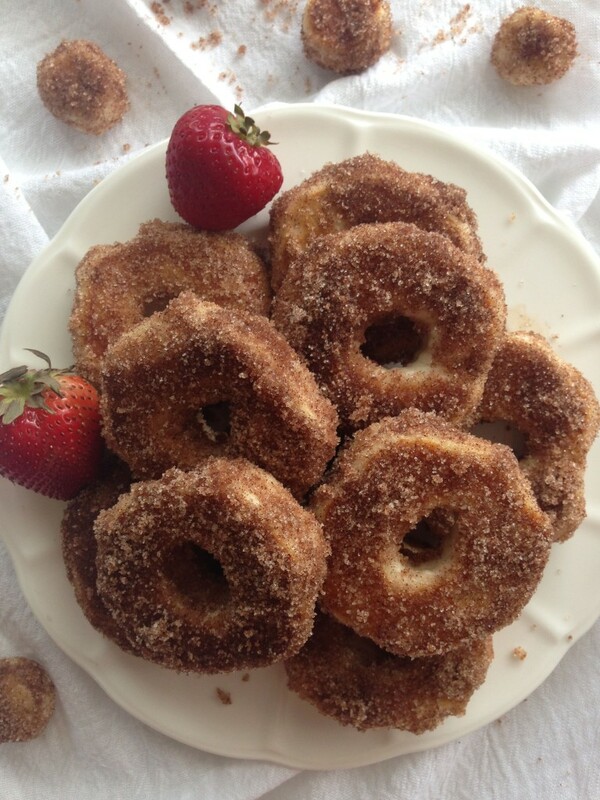 One at a time, dunk each donut in the bowl of melted butter, and then immediately into cinnamon-sugar mixture, coating it on both sides. Enjoy!